The Tour II is a study in refinement. The chro-moly frame and upgraded components make this the perfect touring platform that allows you to find your own road. This is the trike that can take you cross-country or simply across the street for coffee. Great For Cruising or Touring! 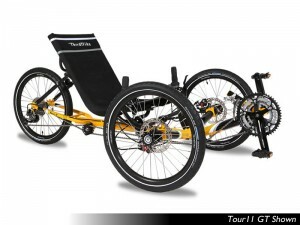 Interested in a Terra Trike? Contact Myrtle Beach Bicycles at (843)215–RIDE(7433) Today for more details and information! With 4 different component groups to match your style of riding, this is the perfect trike for the no-nonsense rider looking for a comfortable ride down the bike path, the cruiser that wants to commute to work or the adventurer who wants to pedal around the world. The Tour II is equipped to handle it all. We took the best elements from three past models and combined them into one. The Tour II is updated with the new standard locking brake levers, a tighter turning radius and finished with our popular Sunset Gold color powder coat finish. Couple this with a BOB trailer and you have as much storage potential as a small car; without the as expense. The Tour II is just as well suited for long and short journeys while carrying all of your cargo. Your South Carolina destination for everything bicycle-related.